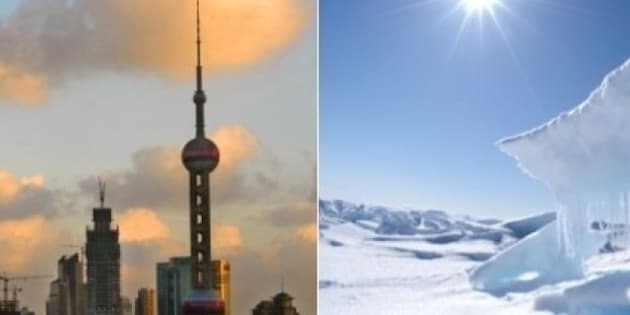 MONTREAL - China may use the upcoming visit by Prime Minister Stephen Harper to try convincing him that it deserves a more prominent role in the Arctic. Next year Canada begins a two-year term as chair of the Arctic Council, which comprises the eight nations that ring the North Pole. Even though it has no Arctic territories, China wants a place at that table. Zhang Junsai, the Chinese ambassador to Canada, told a Montreal audience on Wednesday that his country should be allowed to be there. "Of course, China wishes to be an observer," he said. The Arctic region may contain as much as one-quarter of the Earth's untapped oil and gas, reserves that will become more accessible as temperatures rise and polar ice caps melt. Meanwhile, China covets additional energy and resources to power its fast-growing economy and is already investing heavily in Canada's oilsands. That theme of energy exports is expected to play a central role in Harper's upcoming trip. In his speech Wednesday to the Montreal Council on Foreign Relations, Junsai focused on bilateral relations between Canada and China, and on Harper's visit. Junsai said he believed the trip would have a very positive impact on relations. When asked afterwards by an audience member about Chinese views on the Arctic, the ambassador noted that a number of countries were involved in the region. The ambassador said the two countries can strengthen research and development and business co-operation in a number of fields like the aerospace sector. "Canada is a leading world player in the aerospace industry, while China is developing large passenger aircraft," he noted. "This is the area that we can work together." Benjamin Boehm, the head of Bombardier Aerospace China, says the Montreal-based company wants to be a big part of their aircraft market. "The number of deliveries, especially on the commercial aircraft market side where Bombardier competes, is actually bigger than Europe over the next 20 years," he said in an interview. "That's how many commercial jets China alone will need over the next 20 years." But Boehm dismissed concerns that China might also represent a long-term threat to the Canadian aerospace giant. "Theoretically, you'll be threatened everywhere you go, sooner or later," he said. "The point is to develop mutually beneficial partnerships, industrial-wise, so that you can both grow together — that's really what our intention is in the aerospace market as well."